Home > Fire Safety & EMS > Fire Safety Evacuation Supplies & Tools > Fire Extinguisher Arrow Signs > Jalite Photoluminescent Panoramic Metal Fire Extinguisher Arrow Sign - 4" x 12"
Home > Fire Safety & EMS > Fire Extinguisher Arrow Signs > Jalite Photoluminescent Panoramic Metal Fire Extinguisher Arrow Sign - 4" x 12"
Home > Fire Extinguisher Arrow Signs > Jalite Photoluminescent Panoramic Metal Fire Extinguisher Arrow Sign - 4" x 12"
These double-sided panoramic view photoluminescent fire extinguisher arrow signs are energized by ambient light and will illuminate brightly the instant lights go out. 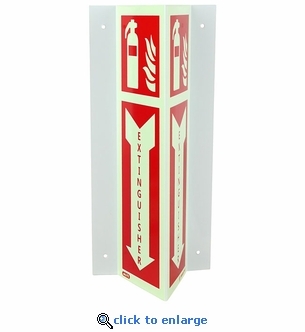 These glow in the dark location signs are perfect for corridors and large open areas to ensure your fire extinguishers are easy to locate in the event of a power loss or fire emergency. Jalite high-perfromance photoluminescent material is charged by common light sources such as daylight, tungsten filament and fluorescent lights. One hour of exposure to ambient light source will sufficiently charge the photoluminescent sign to glow brightly for more than 8 hours. Illuminates instantly when power fails. Viewable from front and two sides. Jalite photoluminescent materials are non-radioactive and non-toxic. Dimensions - 5.5" w x 12" h, 3.75" d - 4" x 12" graphic panels. Two sided with 3/16" mount holes on flanges.